1. Dry roast the rava for a minute. 3. Add curd, sugar, salt, cooking soda, ginger paste and little oil. 4. Mix well until slightly thick. 5. Pour it into a greased pan and steam cook for 20 minutes or until done. Remove and cool for 5 minutes. 7. Fry the mustard seeds, sesame seeds, coconut and curry leaves for 30 to 45 seconds. 8. Pour the tempering over the dhokhla. 9. Cut into pieces and serve with chutney of choice. 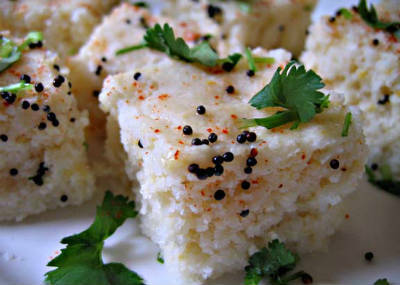 Feel free to comment or share your thoughts on this Rava Dhokla Recipe from Awesome Cuisine.